Kite flying experiments intended to further the study of meteorology and aeronautics, as well as influence possible designs for future flying machines, were conducted in the 1890s at the Blue Hills Observatory in Milton, Massachusetts. The program was administered by the Boston Aeronautical Society, an organization that was founded in the spring of 1895. The society initially consisted of about twenty members, each considered an expert in their field of research. The mission of the society was to encourage experiments with aerial “machines”, (not necessarily mechanical) and to collect and disseminate knowledge relating to solving the problems of aerial navigation, for it was still a time when manned mechanical flight had not yet been perfected. In April of 1896 it was announced that the society had decided to include in its mission the encouragement of research and development of kite design. As an incentive, the society offered monetary prizes for kites that could perform in certain ways. Some of the kite experiments resulted in kite-altitude records being set. On July 21, 1896, what was described as a “flight of kites” was sent up from the Blue Hills Observatory. The kites were strung together in tandem, and the uppermost kite soared to the record breaking height of 7,200 feet above sea level according to the altimeter device which had been attached to the string below it. The observatory, it was said, is situated at 625 feet above sea level. During another flight the string connected to the kites broke while they were 2,000 feet in the air, sending them and the attached instruments sailing off and out of sight. They were later recovered three miles away from their starting point. On August 1st a new kite-altitude record was achieved when a string of kites reached 7,333 feet. The event was witnessed by fifty members of the Appalachian Club. Not long afterward, a new altitude record of 7,441 feet was established. This illustration of William Eddy’s kite configuration as he photographed Boston from above appeared in newspapers of the day. One man who came to Boston to participate in the Blue Hills kite experiments was William Abner Eddy, (1850-1909), of Bayonne, New Jersey. 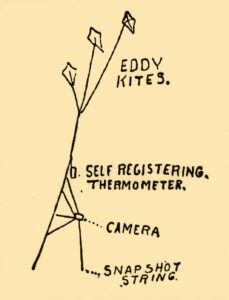 Eddy was the inventor of the “Eddy Kite”; a some-what diamond shaped kite of large proportions which lacked a tail. In August of 1896, Eddy arrived with twenty-two of his kites with the intention of taking aerial photographs of Boston by suspending a camera in the air and working the shutter remotely from the ground. Mr. Eddy was already credited with taking the first aerial kite photograph in the United States in Bayonne, N.J., on May 30, 1895. Eddy began his photographic trials over Boston on Monday, August 24, from the roof of the post office building, and continued them throughout the week. The first picture was taken from an altitude of 400 feet, the second at 700 feet, and the next four at 500 feet. On August 25, as Eddy was attempting to take his seventh aerial picture over the city, the string to the kites broke, sending all nine kites and his camera crashing to the street, but it was reported that it did not appear that the camera was too badly damaged, or the film compromised. When all of the film plates were later developed, it was found that Mr. Eddy had captured some great aerial views of the Boston Common area, Beacon Street, Commonwealth Avenue, Tremont and Washington Streets, and the Charles River. Some were taken from an altitude of 1,500 feet. The kites Mr. Eddy employed for the project measured seven feet in diameter and between four to eight were flown at the same time depending on the wind. Besides his camera, Mr. Eddy also attached a self-registering thermometer to record temperatures at different altitudes above the city to be compared with temperatures above the Blue Hills Observatory from kites being flown there during the same time. In the autumn of 1896 further kite experiments were conducted at the Blue Hills Observatory to gather meteorological data. In these experiments, nine kites attached by piano wire and carrying meteorological instruments reportedly rose to nearly 9,000 feet.